Aldebaran, Alpha Tauri, also known as the Eye of Taurus, is an orange giant star located at a distance of 65 light years from Earth. 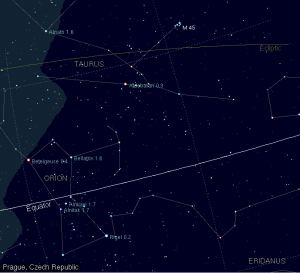 It is the brightest star in Taurus constellation and the 14th brightest star in the night sky. Aldebaran has a luminosity 518 times that of the Sun (153 times in visible light). Orange or reddish in colour, Aldebaran has the stellar classification K5 III and an apparent magnitude that varies from 0.75 to 0.95. 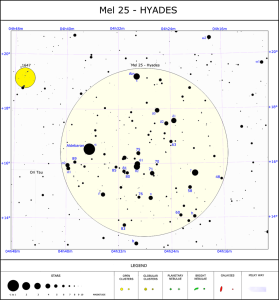 It is classified as a slow irregular type LB variable star and has the designation CSV 6116 in the Catalogue of Suspected Variable stars. 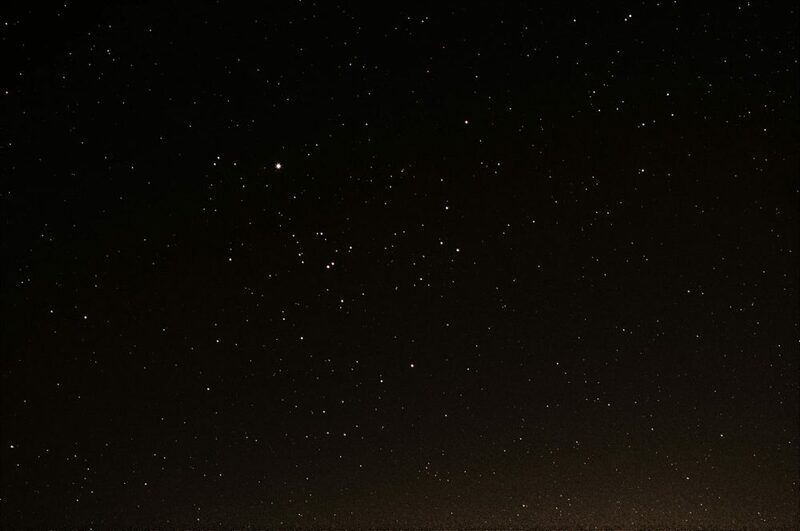 The star’s variability is not visible to the naked eye. Aldebaran has evolved off the main sequence stage of its life cycle and exhausted the supply of hydrogen fuel in its core. It is now fusing hydrogen in a shell around the helium core. As a result, the star has brightened and expanded to a radius 44.2 times that of the Sun. 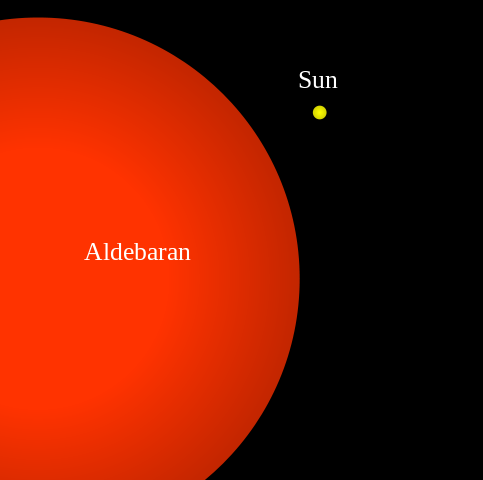 Aldebaran and Sun in scale. If Aldebaran were to replace the Sun in the centre of the solar system, the star’s surface would extend halfway to the orbit of Mercury and would extend across 20 degrees in our sky. The helium burning stage typically lasts tends to hundreds of millions of years, or about 700 million years for a star with a mass equal to the Sun’s, and Aldebaran has 1.7 solar masses. Aldebaran will reach about 800 solar luminosities within the next few million years. Eventually, it will lose much of its current mass through its strong stellar wind and expel its outer envelope to form a planetary nebula, leaving behind a white dwarf. The star is cooler than the Sun, with a surface temperature just under 4,000 K, compared to the Sun’s 5,800 K. It is a very slow rotator, completing a rotation every 643 days. 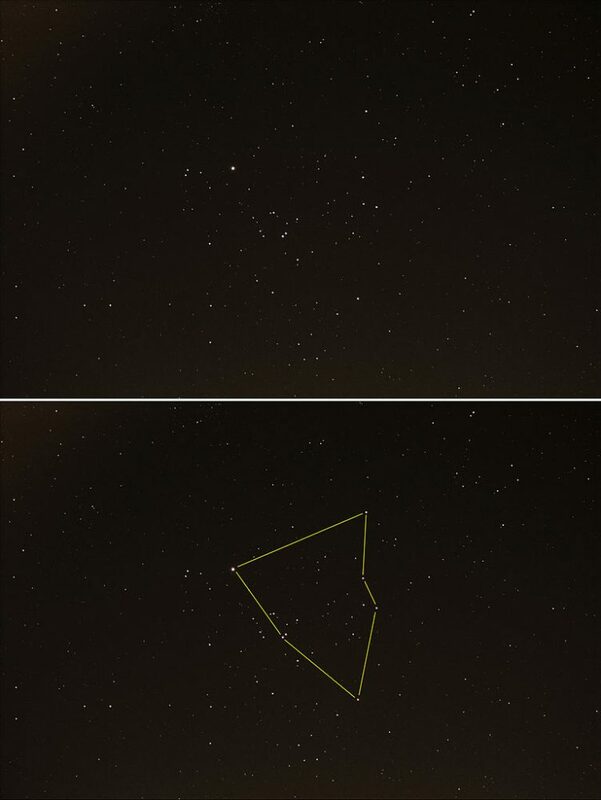 Aldebaran is very easy to find in the sky. To locate the star, observers can just follow the line formed by the three stars of Orion’s Belt to the right (in northern latitudes) or to the left (in the southern hemisphere). 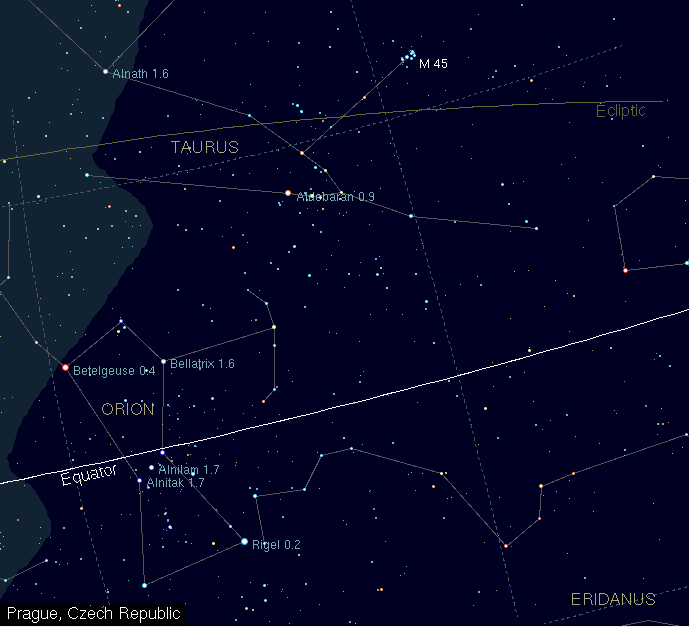 Aldebaran is the first bright star that appears along that line. The best time of year to observe Aldebaran is in the fall and winter months, when the star and Orion’s Belt rise in the east in the evening and move to the northwest over the course of the night. There are five faint stars appearing near Aldebaran, but most of them are just optical companions. The stars were given designations Aldebaran B through Aldebaran F in the order of discovery, while the primary star is designated Aldebaran A.
Aldebaran B is a red dwarf with the stellar classification M2V. It has an apparent magnitude of 13.6 and an absolute magnitude of 11.98. It is separated by about 607 astronomical units from Aldebaran A. Several surveys have indicated that the two stars may share a common proper motion and may not be just optical companions, but form a physical binary star system. However, as the star B is too faint and appears too close to Aldebaran A, astronomers have not been able to confirm this with any degree of certainty. The stars Alpha Tauri C and D are gravitationally bound to each other and form a physical binary system. They are K5 and M2 dwarf/subdwarf stars separated by about 34 astronomical units. The stars lie far beyond Aldebaran A and belong to the Hyades cluster. Aldebaran marks the right eye of the celestial Bull, while Ain, Epsilon Tauri, marks the left eye. Aldebaran lies in the same line of sight as the Hyades open cluster and appears as the brightest member of the famous cluster. 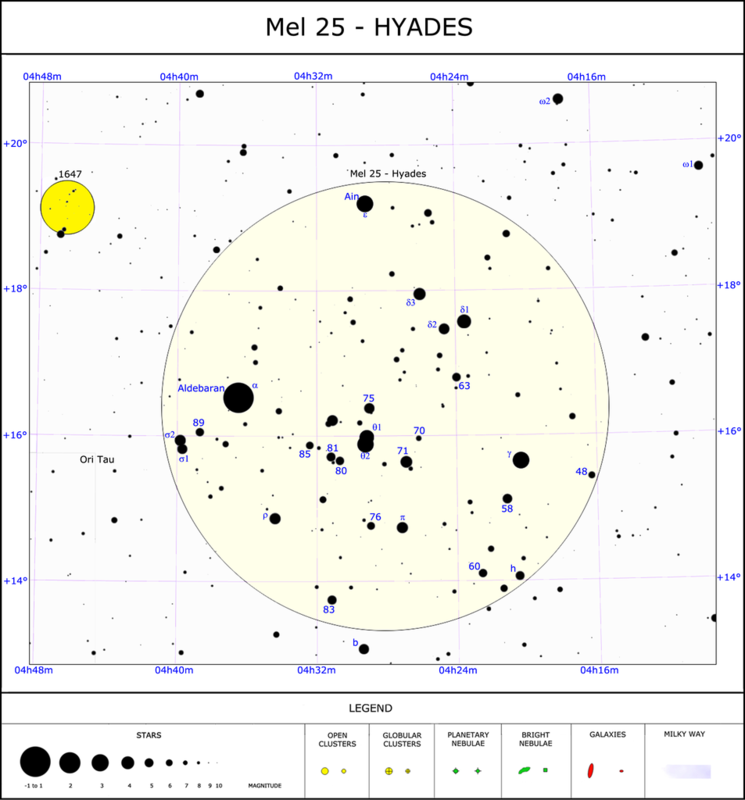 The Hyades cluster, known for its bull’s head V-shape, is in fact some 150 light years distant from Earth, more than twice as far away from us as Aldebaran. 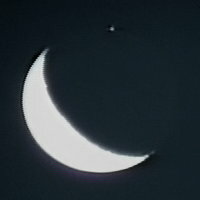 In this July, 1997 still frame captured from video, the bright star Aldebaran has just reappeared on the dark limb of the waning crescent moon in this predawn occultation. Photo by Bart Benjamin. Alpha Tauri lies close to the ecliptic, the apparent path of the Sun, Moon, and planets across the sky, and is often occulted by the Moon. The occultation makes it easy to get a good estimate of the star’s size by taking into account the time it is covered and watching it from different locations. The star is in conjunction with the Sun around June 1 every year. Astronomers reported detecting a substellar companion orbiting the star in the 1990s, but subsequent studies have not confirmed this. If it exists, the companion has a mass at least 11.4 times that of Jupiter and orbits the star every 643 days at a separation of 2 astronomical units. The orbital period of the suspected companion matches the star’s rotation rate. Two other stars that exhibited similar long-period radial velocity oscillations in the same study were Arcturus in Boötes constellation and Pollux in Gemini. The authors of the study concluded that the oscillations were likely intrinsic to the stars and not caused by the gravitational effect of a substellar companion. Aldebaran is one of the brightest stars in near-infrared wavelengths. It has a near-infrared J band magnitude of -2.1 and is only fainter than Betelgeuse, R Doradus, and Arcturus. The star was known by many different names over the millennia. Persian observers knew it as Tascheter. It was the Eastern Royal Star, one of the Four Royal Stars in ancient Persia, along with Regulus in Leo constellation, Antares in Scorpius, and Fomalhaut in Piscis Austrinus. Aldebaran is also known as the Buddha’s Star, God’s Eye, or the Star of Illumination. About 5,000 years ago, the star’s rising marked the vernal equinox and the beginning of the Babylonian new year. Ancient Romans called the star Palilicium. The name is derived from Palilia or Parilia, referring to the feast of Pales, the feminine form of Pan. The Chinese name for the star is Bìxiùwŭ, or the Fifth Star of the Net. 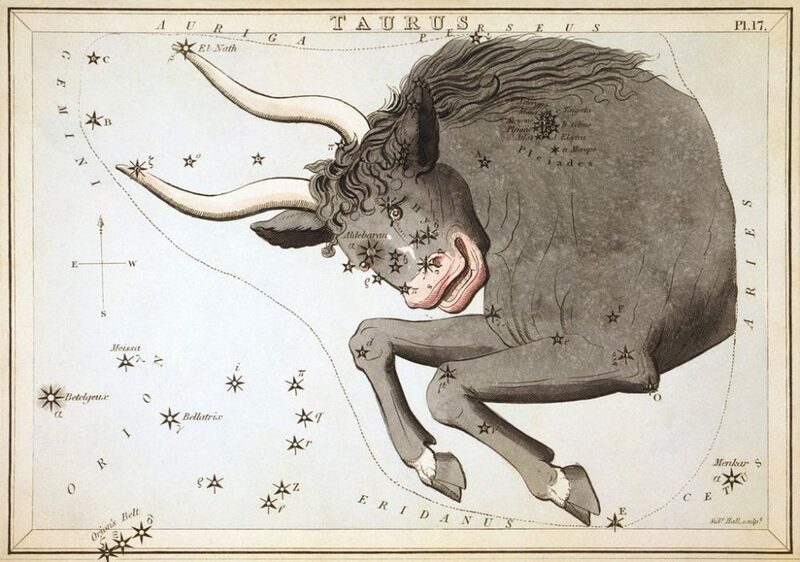 In the Middle Ages, Aldebaran was sometimes called Cor Tauri, which is Latin for the Heart of the Bull. In Hindu mythology, the star is known as Rohini, one of the 27 daughters of Daksha given to the god Chandra as wives. Chandra, the Moon god, fell in love with Rohini and spent all his time with her, neglecting his other wives. This angered Daksha, who cursed the god to suffer from tuberculosis. Other gods intervened and the curse was changed so that Chandra suffers tuberculosis for 15 days and gets well for the other 15 days, which explains the lunar phases. 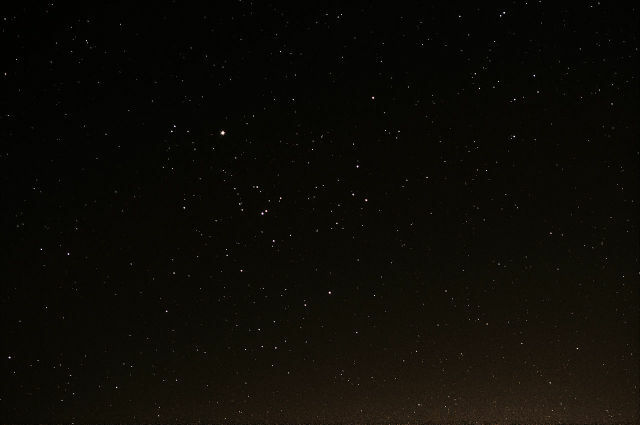 The Seris people in Mexico saw Aldebaran as a star providing light for seven women giving birth. The seven women were represented by the Pleiades cluster. The Dakota Sioux had a legend in which Aldebaran fell to Earth and killed a serpent, which led to the formation of the Mississippi River. In Aboriginal culture, in the Clearance River of New South Wales, Aldebaran was known as the Ancestor Karambal, who stole another man’s wife and was then tracked down by her husband, who burned the tree in which Karambal was hiding. It is believed that Karambal then rose to the sky as smoke and became the star Aldebaran. Aldebaran is often featured in works of science fiction, including H.P. Lovecraft’s The Cthulhu Mythos (1921-), E. E. “Doc” Smith’s Lensman series (1934-1948), Leigh Brackett’s novel The Starmen (1952), Alfred Bester’s classic The Stars My Destination (1956), Ursula K. Le Guin’s The Lathe of Heaven (1971), Joe Haldeman’s The Forever War (1974), Douglas Adams’ The Hitchhiker’s Guide to the Galaxy (1979), Frederik Pohl’s Narabedla Ltd. (1988), and Kim Stanley Robinson’s Blue Mars (1996). The star is also featured in Luiz Eduardo de Oliveira’s comic book series Aldébaran (1994–1998). There are also references to Aldebaran in episodes of Star Trek: The Original Series, The Next Generation, and Enterprise, and also in Buck Rogers in the 25th Century. While the star’s name may or may not have inspired the name of Princess Leia’s home planet, Alderaan, destroyed by the Death Star in Episode IV, Aldebaran does not make an appearance in Star Wars. Alderaan is a planet in a galaxy far, far away, while Aldebaran is a star in the Milky Way Galaxy. Aldebaran is also mentioned in several classics outside science fiction, including Thomas Hardy’s novels Far from the Madding Crowd (1874) and Tess of the d’Urbervilles (1891), James Joyce’s Ulysses (1922), and George Orwell’s Down and Out in Paris and London (1933). The star Borgil in J.R.R. Tolkien’s The Lord of the Rings (1954-1955) has also been positively identified as Aldebaran. Other references to the star include the games Star Control, Frontier: Elite II, FreeSpace 2, and Escape Velocity Nova.